Oslo, October 22, 2018 – Acon Digital has released a new Mastering Suite consisting of five plug-ins for audio mastering based on processing tools from their flagship audio editor Acoustica Premium Edition. The plug-ins were designed for maximum signal transparency and an intuitive workflow. 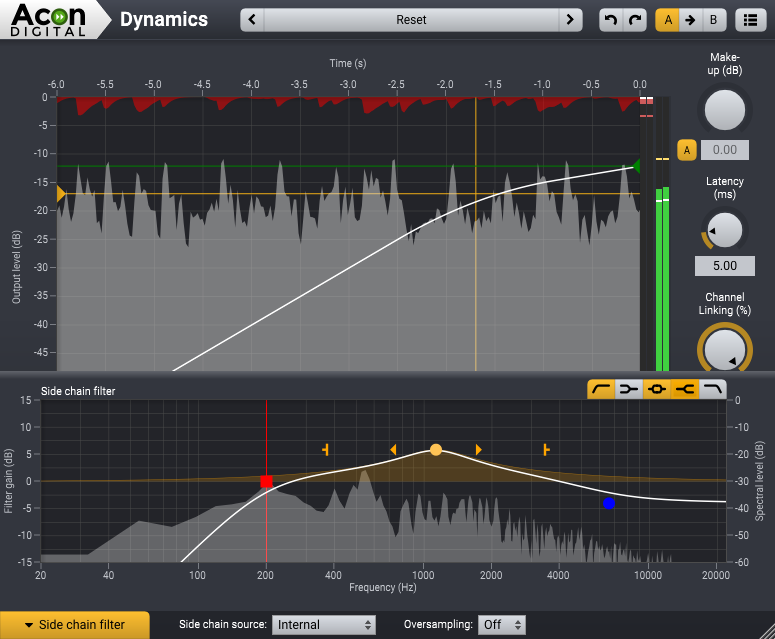 Dynamics is a combined compressor, expander or gate. The look-ahead can be set anywhere from 0 to 30 milliseconds and the intelligent algorithm ensures a band-limited gain signal which reduces potential distortion to a minimum even with minimal attack and release times. You can use up to 4 times oversampling to further reduce distortion. The side chain signal can be either internal or external and there's a full-blown side chain equalizer integrated with low cut, low shelf, peak, high shelf and high cut filters. The complexity of algorithms is not reflected in the intuitive user interface which provides graphical visualizations of all aspects of the processing. Limit is a transparent limiter with intelligent look-ahead in the range 0 to 30 milliseconds that reduces distortion to a minimum. The limiting is performed in a two step process with a pre-compressor followed by the actual peak limiting algorithm. You can use up to 4 times oversampling for true peak limiting and to further reduce distortion. Equalize 2 is a parametric equalizer. Unlike other equalizers, you can freely adjust not only center frequency, gain and bandwidths, but also the filter slope for each band. The filter slope can be set anywhere from 3 dB to ultra-sharp 120 dB per octave. You can operate Equalize as a zero latency plug-in when using the minimum phase mode, choose to preserve the phase relationships in the linear phase mode or use the unique mixed phase mode. The mixed phase mode allows you to set the latency freely in the range 5 to 120 milliseconds while preserving the phase relationships as far as possible. That gives a unique control over potential pre-ringing artifacts which is a common problem with linear phase filtering. The regular price for Acon Digital Mastering Suite is $129.90 USD in the Acon Digital Online Store. However, early birds can purchase the suite for only $99.90 USD until December 1st, 2018. The plug-ins are also included with Acoustica Premium Edition 7.1 which is available for $199.90 in the Acon Digital Online Store. Copyright © 2018 Acon AS. All Rights Reserved.